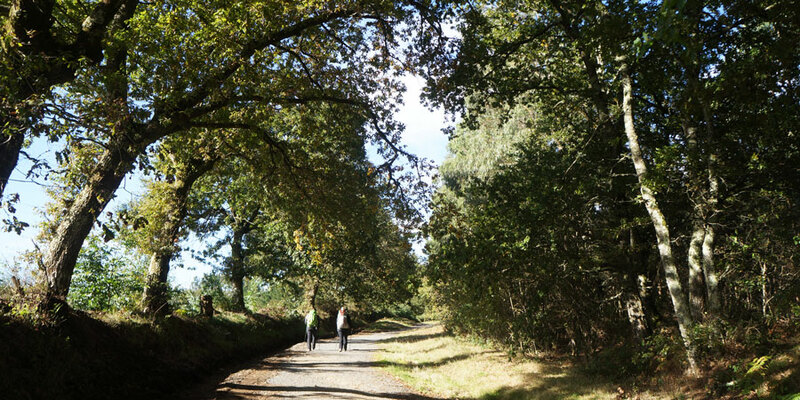 We have selected a few of the most unique Camino rituals: the classic pilgrim greeting, iconic stops… What are your favourite Camino de Santiago traditions? the deepest, most touching Camino rituals in your opinion? Also called ‘credencial’, stamping your pilgrim passport is part of every day life on the Camino. It maps the pilgrim’s journey and reminds you of each of the stops along the way. Although a modern development, taking a sip of Rioja wine at the wine fountain of Bodegas Irache, just outside Estella, has become another unique Camino ritual for pilgrims. Cruz de Ferro, the Iron Cross, is often mentioned by pilgrims as one of those special places on the Camino. Most pilgrims take a few minutes to pause at this humble monument, deposit a memento on the mountain of pebbles left by other pilgrims or simply reflect on the journey and think about our loved ones. The stream at Lavacolla, just outside Santiago, used to be the spot where pilgrims washed and got ready to enter Santiago de Compostela and its cathedral. This is probably one of the oldest Camino rituals we know of. 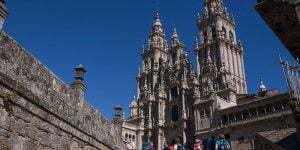 Pilgrim Mass takes place every day at noon in Santiago de Compostela cathedral. It is a very special moment for most pilgrims, having finally reached their destination after a long journey. 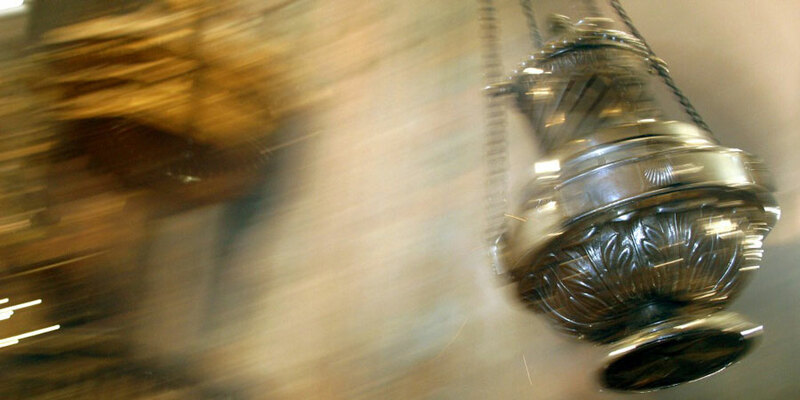 If you are lucky, you might see the impressive ‘botafumeiro‘ censer in action. Another tradition at the Cathedral is hugging St James. The Compostela certificate is your pilgrim certificate, proof that you have walked at least the last 100km to Santiago or cycled at least the last 200km. It is issued by the Pilgrims Office in Santiago. 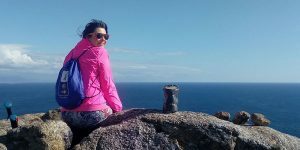 Although most pilgrims finish their Camino in Santiago de Compostela, thousands each year continue to Fisterra, by the Atlantic Ocean, considered the very last stop of the Camino de Santiago. As a purifying ritual, pilgrims traditionally burn their shoes or walking clothes at the Cape, although this is now frowned upon due to obvious health and safety; as well as ecological reasons. However, another Camino ritual that is highly recommended and eco friendly is going for a swim in Fisterra’s Langosteira beach. Watching the sunset over the Atlantic has also become a Camino ritual. You have reached the very end of the Camino! 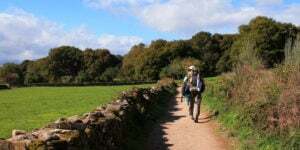 While on the Camino, don’t forget to wish fellow pilgrims ‘Buen Camino!’ or ‘Ultreia‘ as you pass them on your way. Have a safe journey! Do you have any unique Camino rituals you’d like to share? we’d love to know. I will do it again’,age permitting! Thank you for sharing your thoughts, Jane! Picking my favorite of these rituals, was difficult. As an atheists, I was surprised to see that my favorite was attending the pilgrim’s mass. The hominy spoke to me and I was overwhelmed with emotions.